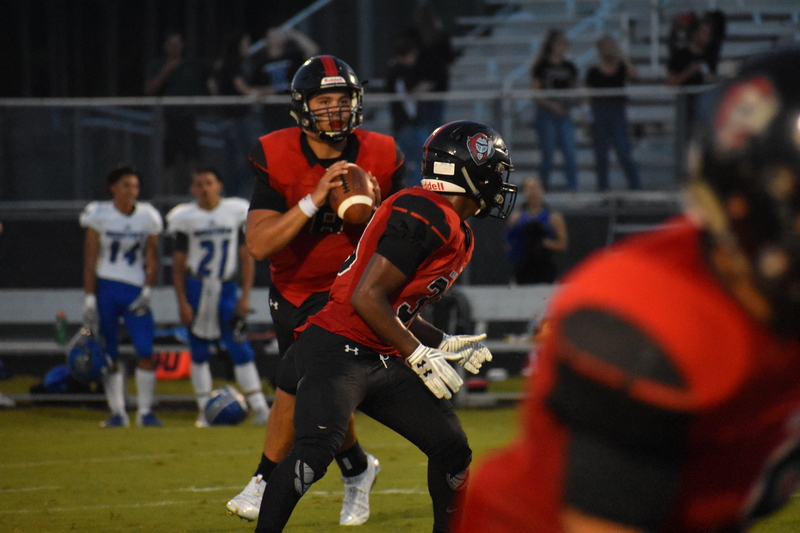 On a night when he was crowned Homecoming King, senior QB Tai Lavatai passed for six touchdowns and ran for a seventh score as Creekside improved to 2-1 with a 48-16 victory over Paxon (1-2). Lavatai tossed scoring passes to four different receivers, including two apiece to senior Blake Scott and junior Christian Williams. Scoreless late in the first quarter, Creekside senior linebacker Abe Cates forced a fumble on a sack and Creekside scored five plays later on Lavatai’s first TD pass, a 9-yarder to Scott. 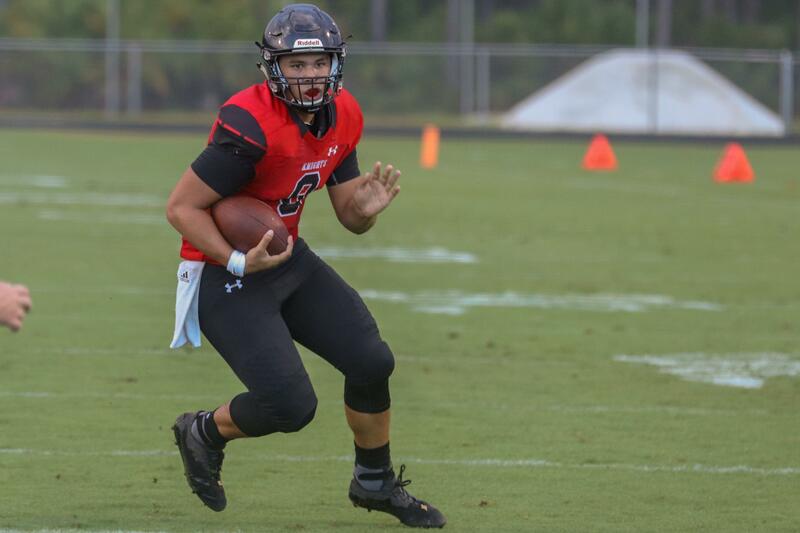 On the ensuing Paxon possession, Creekside’s Jack O’Brien blocked a punt and the Knights scored two plays later on Lavatai’s second TD pass, a 15-yarder to junior wide receiver Quinn Sieger, during a 28-point second quarter. Creekside forced four Paxon turnovers, including three in the first half. The Knights held the Golden Eagles to 88 yards of total offense with minus-10 yards rushing (four sacks of Paxon QB Bryce Tompkins). Paxon’s Jaquan Jaudon intercepted Lavatai in the first half and returned the ball 38 yards to the Creekside 37. But Lavatai (12-24, 146 yards), a Navy commitment, has passed for 10 TDs and run for two TDs in three games — all of the Knights’ TDs so far this season. Last season at Paxon, he accounted for five first-half TDs in a 56-12 victory. 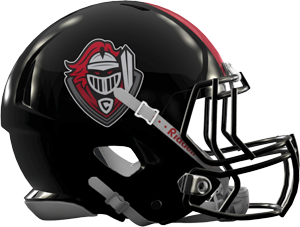 Creekside freshman RB Preston Strope rushed for 132 yards on 19 carries as the Knights had 240 yards on the ground.“Tai’s got to carry the load a lot of nights. With a lot of young guys around him, he’s got to make those guys better. When he does that we can be pretty good on offense,” Creekside coach Sean McIntyre said. 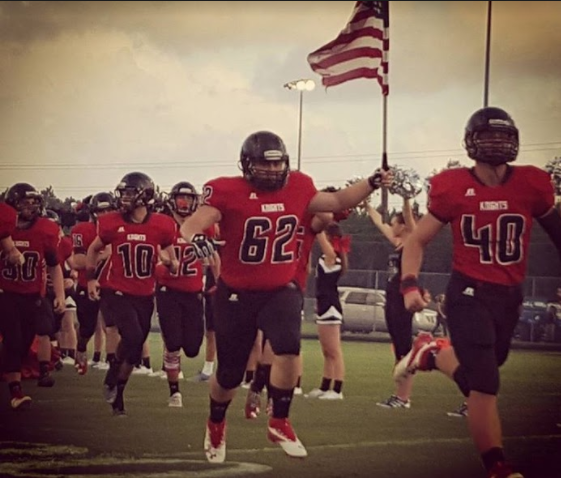 Creekside will integrate a handful of fresh faces on the offensive side of the football. Quarterback, and Navy commitment, Tai Lavatai is not one of them. 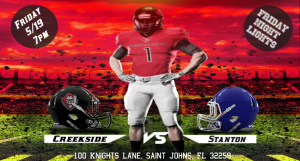 ST. JOHNS, Fla. – The Creekside Knights are a program on the rise. After going winless in 2016 they bounced back and went 5-6 in 2017. On Saturday the school held their fall sports media day. The jamboree games are next weekend and the week after that Football Friday on 4 returns. 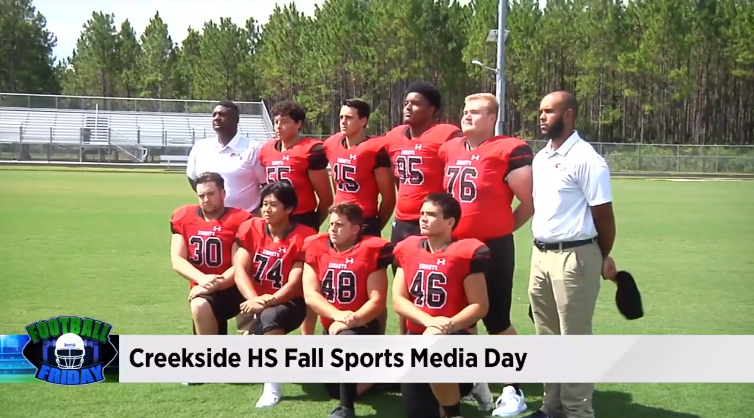 Creekside doesn’t have a lot of experience with only seven returning starters and a handful of seniors. Playoffs are once again the goal but more than anything the Knights seniors want to make sure they do their part to lay a solid foundation for the future of the program. Tonight’s game: vs. Menendez, 7 p.m.
Knights will play: starters into the third quarter, primary backups into the fourth quarter, backups and some JV players to close out the game. Season opener: Aug. 25 vs. Winter Springs. 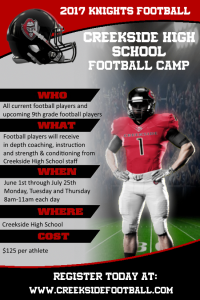 Creekside Knights Football is hosting youth and high school football camps this summer! In this exciting opportunity, young, student-athletes will be provided proper instruction of fundamentals, skill development and strength and conditioning. By receiving personalized coaching from an experienced staff, student-athletes will build skills that are essential to success on the football field. Check out the CAMPS page for more information! The Sean McIntyre era kicked off with enthusiasm and signs of promise. 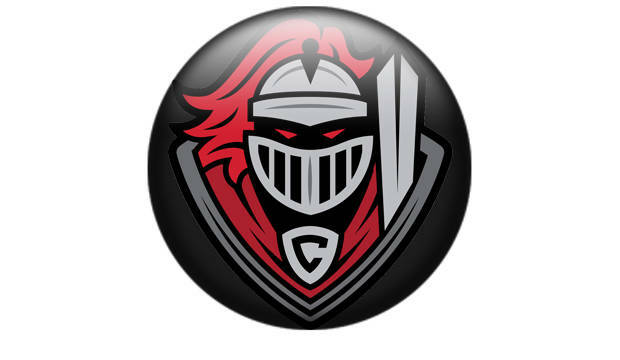 Under Creekside’s new head coach, the Knights showed vast improvement in a commanding 40-14 spring football victory over Stanton College Prep on Friday at Creekside High School. Join the Creekside Crazies as the Knights take on the Blue Devils, Friday, May 19th at 7pm! Come and get a sneak preview of the 2017 Creekside Knights football team! [email protected] Sean McIntyre was named Creekside’s football coach on Thursday. McIntyre, 34, has spent 12 years as a high school assistant coach. As a coordinator at Palm Bay Bayside, Mandarin and St. Augustine his teams won four district titles and won eight playoff games. 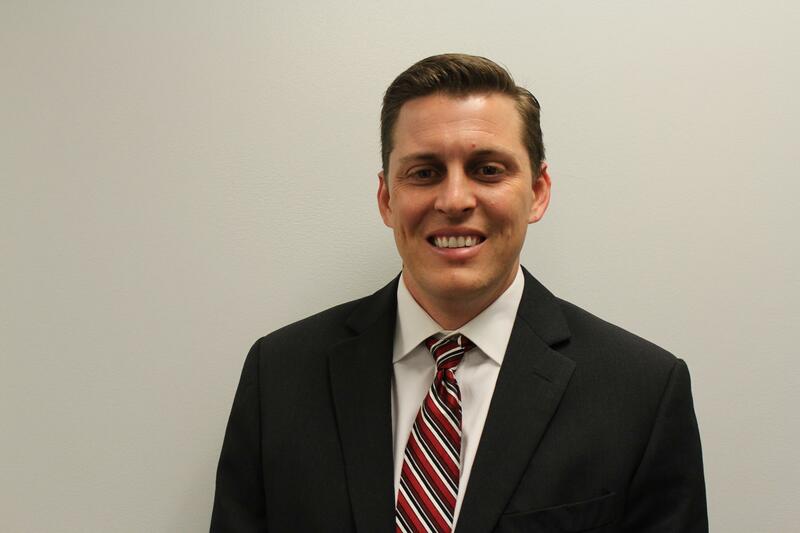 Sean McIntyre was named the third football coach in the nine-year history of Creekside High School. Athletic director Guy Harris introduced McIntyre, the St. Augustine High offensive coordinator, on Thursday evening. “My wife [Maegan] and I are extremely excited to get to know these kids,” McIntyre said. “To get to know their heart, get to know what drives them and what fuels them. That’s why we are in this business, because of the kids. … There is a lot of school spirit here. When those people see how hard these kids are going to play and how hard they are going to play the game of football, it’s going to be something that makes them proud. McIntyre has spent a dozen years coaching at the varsity level, but this will be his first head coaching position. St. Augustine, Mandarin and Palm Bay Bayside have won a combined four district titles and eight playoff games with McItyre serving in a coordinator capacity. As a defensive coordinator at Bayside the Bears won a pair of district titles and four playoff games in four seasons. In addition to the 2016 season at St. Augustine, McIntyre spent three seasons as the offensive coordinator at Mandarin under Brian Braddock. During that four-year run together, their teams won 35 games and advanced to the regional finals twice. Coaching under Braddock for four years was an admitted thrill, McIntyre said, but what may have set the 2016 season apart for the 34-year-old coach was the opportunity to work with his father-in-law, St. Augustine safeties coach Jim Mathisen. Mathisen is not the only coaching mentor of McIntyre’s. Creekside’s new football coach said Braddock, former St. Augustine head coach Joey Wiles and his late father, Tom McIntyre, were all coaching mentors. Tom McIntyre was an institution at Melbourne High during the 1980s, and early ‘90s. The school’s football stadium is named after him. Wiles, who is now the assistant athletic director for development at Flagler College, also coached at Melbourne. The longtime St. Augustine coach was one of three people on the Creekside interview committee with Michelle Clark and Patriot Oaks Academy principal Emily Harrison. Harris said the school gathered a parent focus group to help whittle down the more than 100 applicants. The Creekside athletic director had a deep appreciation and understanding of what will be ahead of McIntyre, in no small part because he assumed the head coaching position on an interim basis from Jeff Schaum in October. Creekside finished 0-9 this season. The Knights, who are in District 3-7A along with Bartram Trail, Gainesville Buchholz, Oakleaf and Fleming Island, have tied a St. Johns County record with 22 consecutive losses.